By learning the techniques in Stop Stress This Minute, you will be better prepared to manage whatever stress comes your way. Managing stress is not as hard as you think. In fact, you can lower your stress right now. Not next week, or next month or even next year, but right this minute. 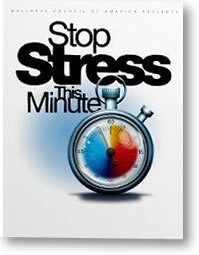 Download and read the first chapter of Stop Stress This Minute and discover your Stress Number. 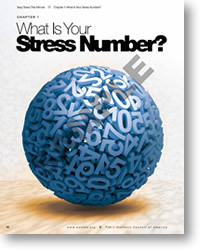 Much of our stress is cumulative and major stressful events usually don't happen out of the blue. Often times, it's a cascading series of events, the first couple of which might be too minor to notice. But as these events build, so do the stress hormones in your body, and so does the likelihood of you getting even more stressed. When you stop to get your stress number you are self-monitoring your stress hormone levels and gives you the opportunity to stop your stress from getting out of control. Requires a PDF reader like Adobe Acrobat Reader to view.